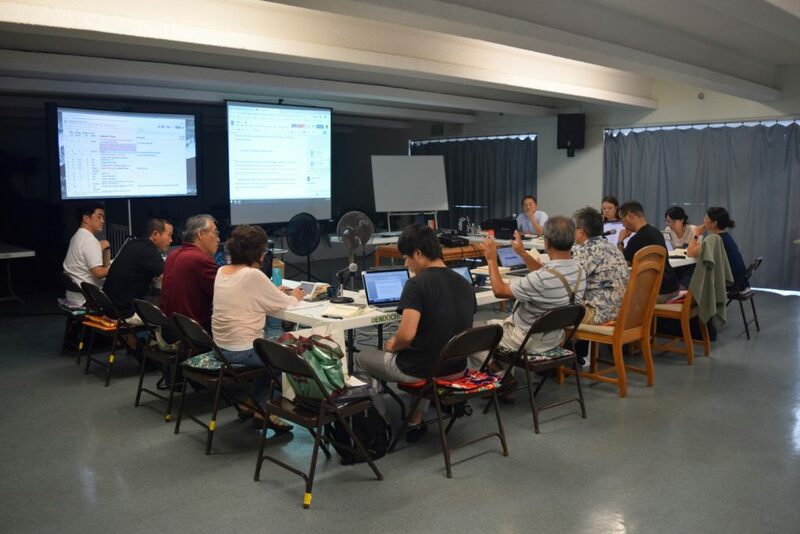 The 2018 translation conference, organized as part of a project on the retranslation of Anecdotes of Oyasama, was held at the Mission Headquarters of Hawaii from October 29 to November 2. This project was launched on the initiative of the translation committees of the America and Canada Diocese and the Hawaii Diocese and attempts to produce a more accessible translation than the current version published in 1979. There were a total of 15 participants from Hawaii, the U.S. mainland, and Jiba. The local participants were Rev. Tsunenori Ichise, Rev. Colin Saito, Mrs. Taeko Nakao, Rev. Setsuo Kakitani, Mrs. Janyce Imoto, Rev. Tad Iwata, and Mrs. Joy Robinson. Attending from the mainland were Rev. Marlon Okazaki, Rev. Takahiko Hayashi, Rev. Michael Yuge, and Ms. Hanna Ryono. From the Overseas Department, Rev. Masaharu Matsuda and Mr. Akihiro Yasuda attended the conference. Also, Mr. George Blesch and Mr. Motonao Yasui occasionally joined the discussion by Skype from Cupertino, California, and Jiba, respectively. Prior to the conference, the work of preparing draft translations of stories in the Anecdotes had been divided among a number of followers in Hawaii and the mainland. The participants in the conference worked on the first dozens of stories. They engaged in lively discussions while contemplating how things might have been when Oyasama was physically present. This retranslation project is expected to continue next year and beyond.